Some paths lead to an early grave. A power failure on the midnight train from Innsbruck to Vienna has stranded Felix in the middle of nowhere. It’s not a good start to his getaway, but it’s made worse by the presence of a fellow passenger who won’t stop sizing him up. With his scant few belongings thrust into a backpack, Felix wants nothing more than to get to the airport and fly home to London. Whatever he does after that can’t be any worse than staying in a failing, rancorous relationship. But Felix has always been a magnet for dangerous men and the handsome stranger who keeps eyeballing him isn’t so easy to ignore. As the world itself seems to spin on a dime, Felix follow his admirer deeper and deeper down the rabbit hole, until retracing his steps becomes as trying as it is inevitable. Reader Advisory: This book contains past domestic violence as well as past physical and emotional abuse. Have you ever read a book that flipped the cinema switch inside your brain? You know, when you see the words clear as day. Occasionally I come across a story that feels like I’m watching it rather than reading it. This was definitely one of those instances. I’ve quickly come to anticipate and appreciate the expressive and almost animated prose of Maeve’s style. This is my second story from her bookshelf and while the differences are massive, the similarities are strong as well. Smooth lyrical tone with sharp characters and a transparent ending. I couldn’t grasp the final few paragraphs if my life depended on it. As if I was trying to collect fog or the morning mist, it continued to slip through my fingers. In spite of the finale, I was entranced and thoroughly entertained. We begin on a train traveling through Austria. Felix is alone, running, and hiding secrets. And oh how the secrets haunt us. When the train stops due to a power failure he is lured by a mysterious man into the woods. We don’t know what exactly the stranger wants, but Felix is willing to find out. Felix finds himself in a whirlwind of confusion and more questions than answers. I can totally relate. One thing he does know, and knows with certainty, is that he wants to be with Stefan. Stefan envelops him a thick blanket of desire, security and tranquility; a cocoon that he is unfamiliar with. We are given snippets of his previous relationship and not only is it dark, but it’s the reason he is fleeing. His boyfriend was abusive and he is overwhelmed with guilt and holds himself responsible for the violent tailspin his life took. I can’t divulge much more without giving away clues and believe me the clues are flashing like a neon sign if you know where to look. My first time through, I missed some of them, but was kicking myself for my obliviousness during my reread. My head is still a little foggy but I’m hopeful for a continuation of the story because I’m just not ready to be done with Felix and his journey. I’ve got to know where his final destination is. If you are willing to take a seat on this crazy train with me, try seat 65….it’s vacant at the moment. 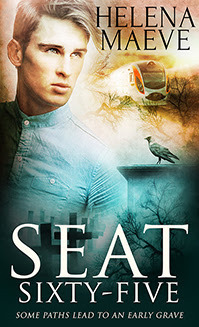 This entry was posted on September 28, 2015 by Sheri in Contemporary, PNR / UF / SF / DYS, Reviewer: Sheri and tagged 3.5 Stars, Helena Maeve, novella, Paranormal, Pride Publishing.